Be Prepared. Hurricane Season Has Arrived. Home:Be Prepared. Hurricane Season Has Arrived. As Hurricane Michael approaches the Florida Panhandle now is time time to make sure your preparation plan is in place. Having an emergency supply kit ready and easily accessible will help you with any type of natural disaster. This kit will be important if you are in your home without electricity or if you are forced to evacuate your home. Your kit should contain: a three-day supply of bottled water and non-perishable food, a battery-operated radio, flashlights, batteries, a first-aid kit, family prescription medicines, pet supplies and important family documents. 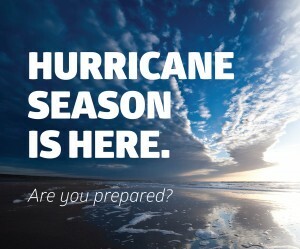 For more ideas on stocking your emergency supply kit, visit www.floridadisaster.org. Your family should also have a meeting place if you are forced to evacuate your home. This includes a spot in your neighborhood and a place to meet if your neighborhood is evacuated. Practice evacuation drills during the day and at night so that everyone knows where to go. There are also a few steps you can take to protect your home against severe weather. Clean out clogged gutters and downspouts. If the rain that accompanies a heavy storm can’t run through the gutters and downspouts, it will spill over the sides, landing in areas where it can soak through to your home’s foundation, causing flooding and structural damage. Keep the elements out. Try to prevent wind and water from entering through windows, cracks, entry doors and garage doors. Especially in hurricane-prone areas it is important to seal your windows and doors as tightly as possible. You can purchase and install special storm shutters to cover your windows. Secure all doors. If you live in an area that frequently gets heavy storms, consider installing steel entry doors. High winds can easily tear through double doors, French doors and sliding patio doors that have no structural support between the two sides. You may need to purchase and install special hardware to more adequately secure the doors where they meet. Try bolts that fasten the door into the framing at the top and the bottom. Check your roof. A strong roof is another essential element in preparing your house to withstand a severe storm. Apply sealing around your home’s chimney or vent pipes. This will help prevent water from seeping into your home. Hire a contractor to check the structural integrity of the roof system. Click on this link to go to the Disaster Contractors Network’s Online Directory. What Should I Do if a Hurricane Hits My Community? For TBA Contractors – Hurricane Preparedness Contractor List.